Thank you. 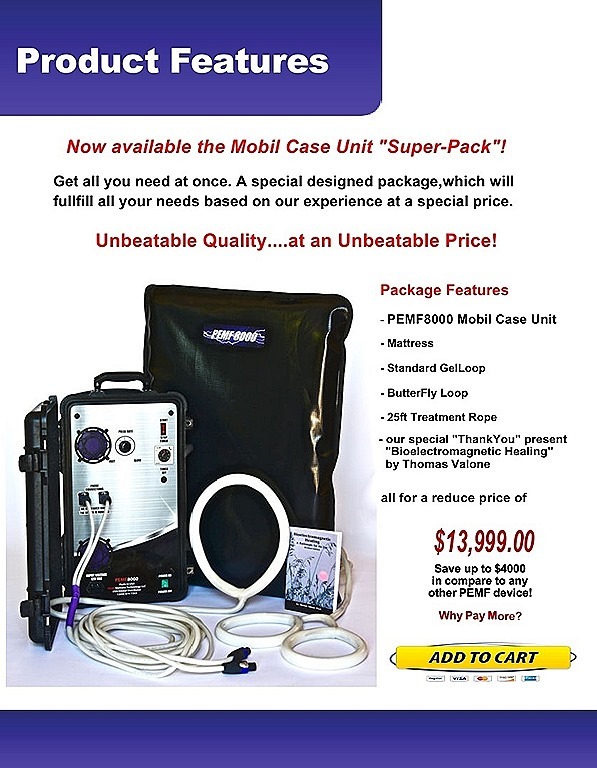 Thank you for your support of PEMF Wellness Technology and our amazing PEMF8000 Devices! Thanks to you we had the most successful and amazing year. 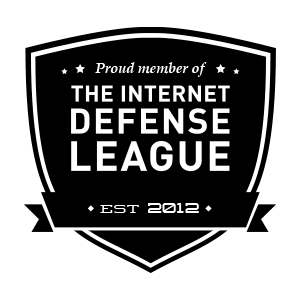 We thank you from each and every one of us here. We also appreciate your continued efforts to send us your inconceivable testimonies of healing and wellness! We will continue this year to compel our company and PEMF technology to the pinnacle of all healing and wellness devices. “Thanksgiving Day comes, by statute, once a year; to the honest man it comes as frequently as the heart of gratitude will allow”. You also may want to read my “Appreciation and Gratitude Story”! Call me today for our “Appreciation” Gift! PEMF Therapy! The new medicine of the Future! For a few years now, I have been researching PEMF and how to incorporate it into my natural healing practice. With the myriad of different systems available, I wanted to ensure I chose a PEMF system that was robust, effective and made in the United States. After reviewing a few systems, I decided to use one that several of my colleagues found very effective and that stood the test of time in regards to durability and one that effectively improved my patients’ healing ability. In my office, patients who have chronic knee pain, chronic shoulder pain, frozen shoulder, neuropathy, fibromyalgia, Parkinson’s disease, and a host of other chronic and acute health challenges are benefitting from cellular exercise using our PEMF8000. 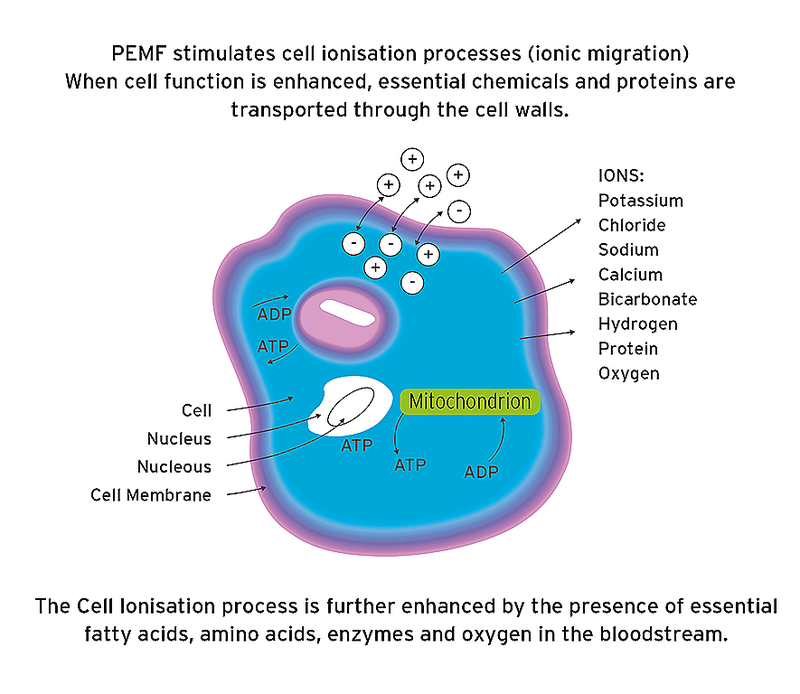 § PEMF changes your energy at the cellular level. 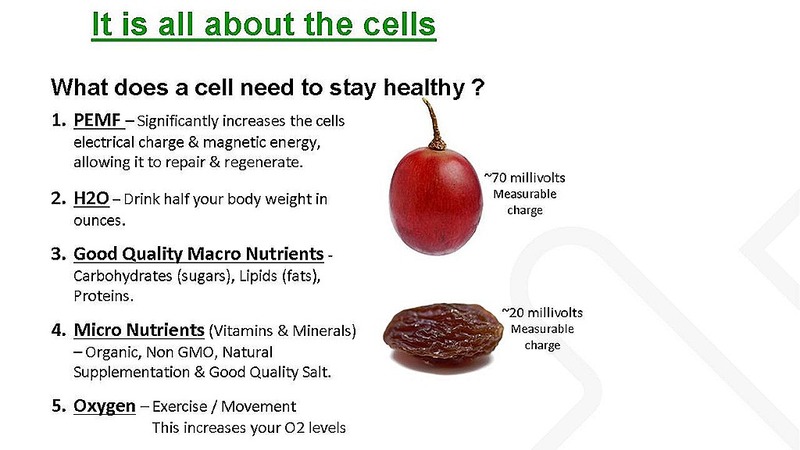 Remember you are made of over 75 trillion cells in your body. Cells are the basic building blocks of all living things. 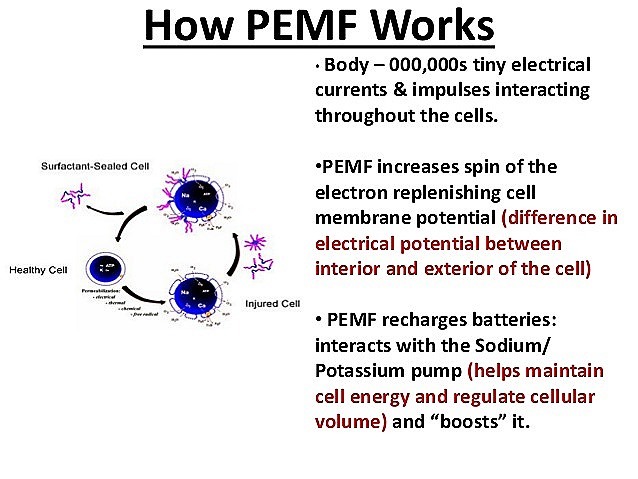 PEMF affects the capacitance of all the cells it contacts, improving their ability to hold a charge. Capacitance is the ability of a cell to store an electrical charge. Recharging the cells accelerates the body’s natural healing ability. 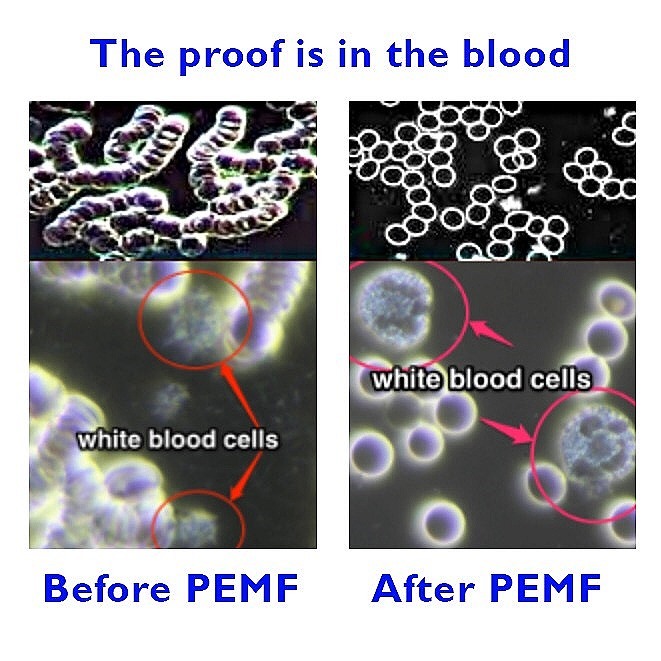 § PEMF directly affect the systems responsible for healing the body. No healing, repair or growth takes place in the body without the signals, or electrical impulses, sent by the central and peripheral nervous systems. PEMF directly impacts the nervous system. 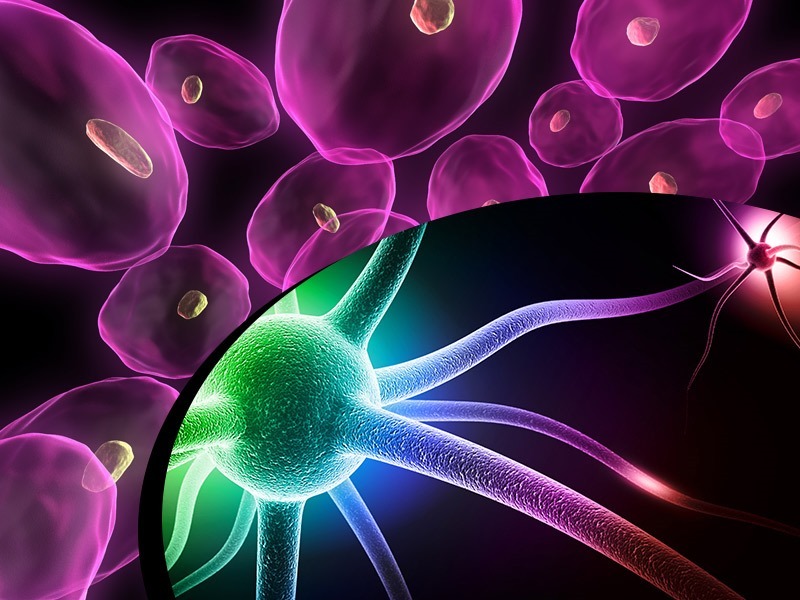 § PEMF stimulates GABA (an inhibitory neurotransmitter that calms and relaxes nerve impulses). GABA is a neurotransmitter, which is a chemical used by our nervous system to conduct appropriate nerve impulses. GABA is responsible for calming the nervous system by improving the ability to turn off the sympathetic nervous system (the fight or flight portion of our autonomic or automatic adapting nervous system) and turn on the parasympathetic nervous system (the rest and digest portion of our autonomic nervous system). PEMF has also been found to induce GABA in certain parts of the brain. When the body relaxes, the parasympathetic nervous system takes control and the body can start or continue its natural healing process. § PEMF improves sleep and promotes relaxation. According to the National Sleep Foundation, 48 percent or Americans complain of occasional insomnia. PEMF increases GABA levels and counteracts the sympathetic nervous system response in the body. These actions help promote better sleep and reduce stress. § “Increased Circulation. One of the most basic functions magnetic fields have in the body is to increase circulation. When a cell (such as a red blood cell) is injured or ill, it does not hold its ideal charge. This causes red cells to “stick” together, making circulation slow. When a magnetic f ield passes through the red cell, the membrane becomes properly charged, allowing the cell to repel itself and keep itself separate from other red cells, thereby increasing circulation. In addition, PEMFs increase various chemicals in the blood vessel walls that cause the blood vessels to dilate, improving the amount of blood flowing through the vessels and therefore increasing the amount of oxygen delivered to the tissues. § Enhanced Muscle Function. Muscle energy, needed for muscles to work, is developed through a process called Myosin Phosphorylation. Myosin is muscle, and phosphorylation is energy (ATP) production. Optimal energy allows muscles to work harder and longer, and recover more quickly from their work. Muscles that are contracted or in spasm are better able to relax, decreasing tension and reducing the pain caused by spasm. § Decreased Inflammation. Inflammation is a cascade of physiologic processes initiated by the body to repair cellular damage in tissues by increasing the blood flow to the damaged area and increasing the number of good inflammatory cells. The process of inflammation is generated and supported by the interaction of a number of immune cell types, with other cell types (like T cells) playing a regulatory role in the cascade effect. Inflammation is a necessary and beneficial process, but it often persists longer than necessary, resulting in chronic inflammation. Chronic inflammation is frequently a cause of chronic pain. PEMFs have been found to reduce chronic, damaging inflammation. Inflammation can be initiated by many causes, and knowing the nature of the cause is important in designing therapeutic approaches. T cells are a major regulator of the inflammatory cascade. In bacterial infections, early infiltration of the affected tissues by white blood cells is followed by the arrival of T cells, which kill bacteria. In this circumstance, elimination of T cells can delay or stop healing. Conversely, in trauma-induced injury, T cells are less important to the healing process, and may be harmful if present for too long. In this case, elimination of T cells can minimize the unwanted effects of inflammation, accelerate healing, and reduce the risk of chronic inflammatory diseases. 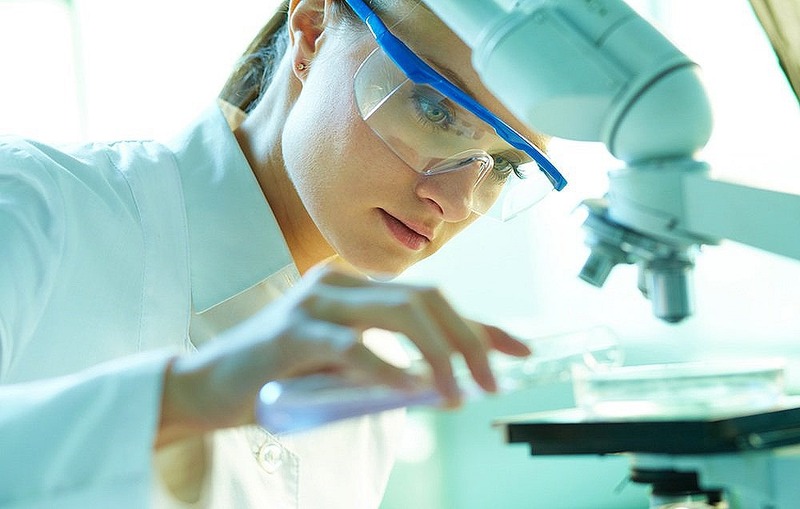 In chronic inflammatory diseases such as rheumatoid arthritis, psoriasis, or tendinitis, T cells support the persistence of the disease state, and removing them would be favorable. § Stress Reduction. Stress is part of being human. Normal stress, called eustress, is necessary for survival. Too much stress is very harmful to the body, and accelerates aging. Stress is responsible for at least 65% of our illnesses, so stress reduction is necessary for all of us. Stress-reducing activities, performed on an occasional basis, will allow too much stress-related damage to accumulate over time. Therefore, stress reduction must be a daily activity. Magnetic fields have many stress-reducing effects. Daily use of PEMFs help to wash away the negative effect natural stresses have on our bodies. § Bone Healing. Magnetic fields pass through the body – even the bones – as if the body wasn’t even there. PEMFs work to repair bones, whether they are damaged by surgery, injury, or disease, and have been found to improve bone regeneration such as occurs with osteoporosis and osteopenia, among other bone destroying conditions. § Blood Oxygenation. Just as a fire cannot burn without oxygen, our cells cannot produce heat and energy without oxygen. Our lungs extract oxygen from the air we breathe. It passes into our blood and is carried by arteries away from the heart and delivered to the rest of the body, including all the organs. PEMFs help with the process of extracting oxygen out of the air we breathe and help it to be transported into the circulation. The absorbed oxygen is then transported through the body to all the cells, where it is absorbed into the individual cells. In the cells, enzymes and other basic cell energy production processes use the oxygen for cell metabolism, the energy necessary to function properly. The metabolism of an organism determines which substances it will find nutritious and which it will find harmful. Proper blood-oxygen levels at the cell level (not just in the blood) allow this process to continue quickly and efficiently. After the oxygen exchange takes place, veins carry deoxygenated blood and metabolic waste products away from those same cells and back to the heart for recycling again.